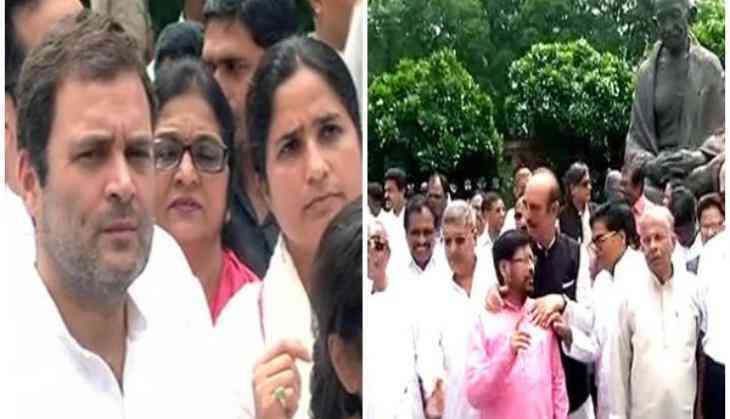 Congress Vice President Rahul Gandhi along with other party members and the rest of the Opposition, protested outside the Parliament at the Gandhi statue here today against the suspension of six Congress MPs by Lok Sabha Speaker yesterday. The Congress Party said that Lok Sabha Speaker Sumitra Mahajan should have given the six party MPs a chance to explain their stand before she suspended them. Leader of Opposition in Lok Sabha Mallikarjun Kharge said that such an incident never took place under former Lok Sabha speaker Meira Kumar, who never lost her cool amid usual turbulence which the lower house faces often. Echoing similar sentiments, another Congress leader PL Punia said that it has become a trend in the floor of the house where opposition leaders are not allowed to speak. "When an MP sees that the session is not been conducted impartially and they are not allowed to speak, he tries ways to keep his point of view in front of the house. Not allowing MPs to speak has become a trend. Mayawati Ji was not allowed to speak. Opposition party members are not being allowed to speak at all," said Punia. After the Lok Sabha witnessed uproar during the zero hours, Speaker Sumitra Mahajan yesterday suspended six Congress MPs for five days citing unruly behaviour. The suspended MPs are Gourav Gogoi, K. Suresh, Adhiranjan Chowdhary, Ranjeet Ranjan, Sushmita Dev and MK Raghwan. The members threw pieces of paper and disrupted proceedings during zero hours when issues of mob lynching and Bofors scam were brought up. The Opposition members demanded the Prime Minister Narendra Modi's presence to discuss the incidents of lynching in the name of cow protection. Congress members tore and flung papers on the Chair and raised slogans against the government. Even after the Speaker's repeated appeals for calm went unheeded and she adjourned the House for lunch.